Springfield beats Portland for the fifth time this season, breaking the game open with two late second-period goals. 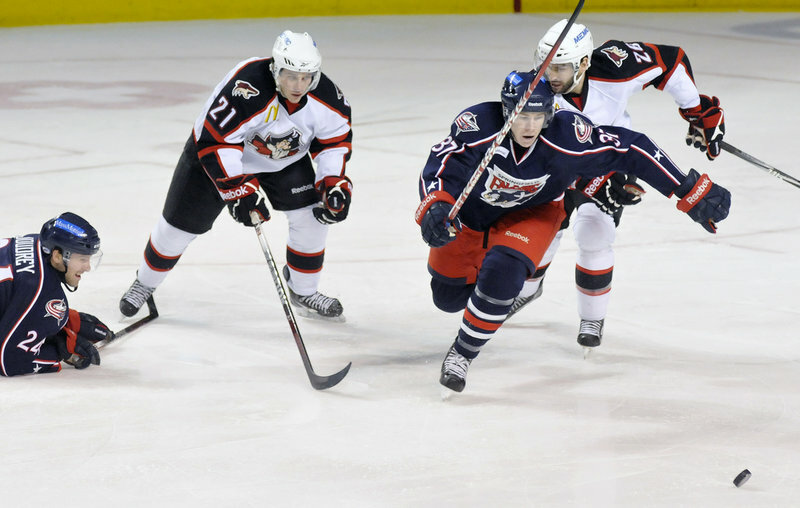 PORTLAND – Maybe, the Springfield Falcons just have the Portland Pirates number this season. The Falcons made it look awfully easy Sunday afternoon in cruising to a 6-2 win before a crowd of 4,426 at the Cumberland County Civic Center in a game between two teams battling to stay in the race for an AHL playoff berth. Matt Calvert of Springfield goes after the puck while being chased by Portland’s Andy Miele and Mathieu Beaudoin in Sunday’s game at the Cumberland County Civic Center. The Falcons won 6-2, the Pirates’ 10th loss in their last 14 games. 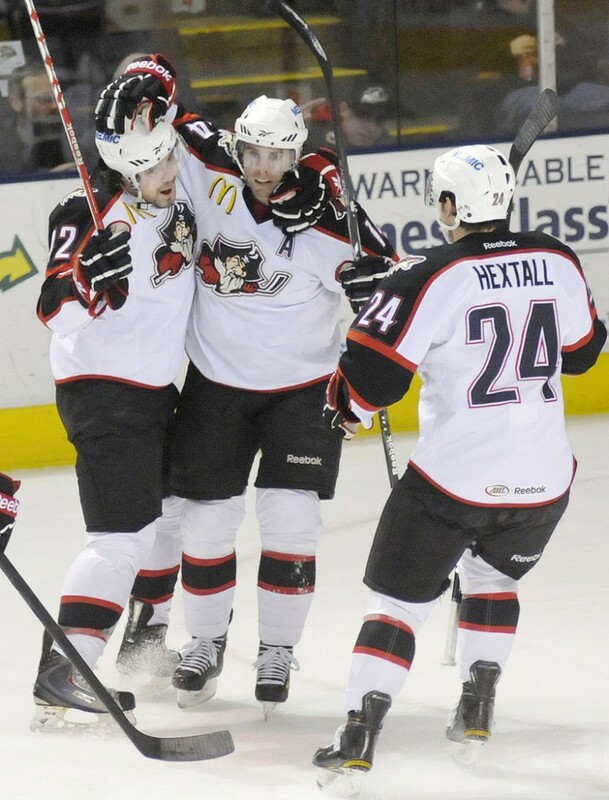 Nick Ross, left, celebrates his first-period goal with Pirates teammates Matt Watkins and Brett Hextall. It was Ross’ first AHL goal since April 8, 2008. The Falcons have won 5 of 7 against the Pirates. Springfield is two points behind Albany for the eighth and final playoff spot in the AHL’s Eastern Conference. The Pirates snapped a three-game losing streak with a 5-1 win at Worcester Saturday night, but have lost 10 of their last 14 games and are four points out of a playoff spot with 20 games remaining. 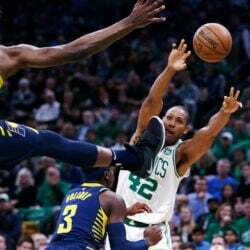 Despite the lopsided score, Pirates Coach Ray Edwards said his team played well enough to win. The game’s turning point may have come 11 minutes in when a goal by Ryan Duncan was disallowed because another Pirate had come in contact with goalie Paul Dainton. The goal would have tied the game at 1-1. Springfield took a 2-0 lead during the first 13:21 on goals by Alexandre Giroux and Maxim Mayorov. Mayorov’s breakaway goal was the seventh short-handed goal the Falcons have scored against the Pirates this season. That prompted Edwards to pull goaltender Justin Poggie, who saw just four shots in his 13:21 in net, in favor of Marc Cheverie. With less than five minutes left in the first period, Portland defenseman Nick Ross scored his first AHL goal since April 8, 2008 to make it 2-1. Less than six minutes into the second period, Springfield took a 3-1 lead when Giroux scored his team-high 20th goal on a shot from the top of the right circle. It was the 360th goal of his AHL career putting him eighth on the league’s all-time scoring list. Less than a minute later, rookie Spencer Bennett, playing in his third game after missing nearly two months because of a wrist injury, tipped MacLean’s pass from across the slot into the left side of the goal for his second AHL goal to make it 3-2. Mayorov and Adam Mair scored goals two minutes apart to send the Falcons into a 5-2 lead with less than four minutes left in the second period. Wade MacLeod scored on a breakaway with less than eight minutes left in the game to complete the scoring. NOTES: Patrick O’Sullivan, who spent the third period of Saturday night’s 5-1 win at Worcester on the bench, was scratched from the Portland lineup. The Coyotes sent Alexandre Bolduc and defenseman David Rundblad back to the Pirates, but they didn’t arrive in time for the game.